Phasellus accumsan cursus velit. Pellentesque egestas, neque sit amet convallis pulvinar, justo nulla eleifend augue. Meet Our World Class Medical Professionals. Dr. Tracy Ng was born and raised in Queens, New York where she was Valedictorian at Bayside High School. After high school, she attended Binghamton University, part of the State University of New York (SUNY) system, where she maintained her presence on the Dean’s List and obtained a degree in Psychobiology. Dr. Ng completed medical school at New York College of Osteopathic Medicine in Old Westbury, New York, where she was Class President. She then went on to complete her Orthopaedic Surgery residency at Plainview Hospital, a part of the North ShoreLong Island Jewish Health System. While there, she also served as the Department of Orthopaedic Surgery’s Chief Resident. After residency, Dr. Ng completed an additional year of training in sports medicine and arthroscopy/minimally invasive surgery at the Mississippi Sports Medicine and Orthopaedic Center (MSMOC) in Jackson, Mississippi and Tulane University in New Orleans, Louisiana. 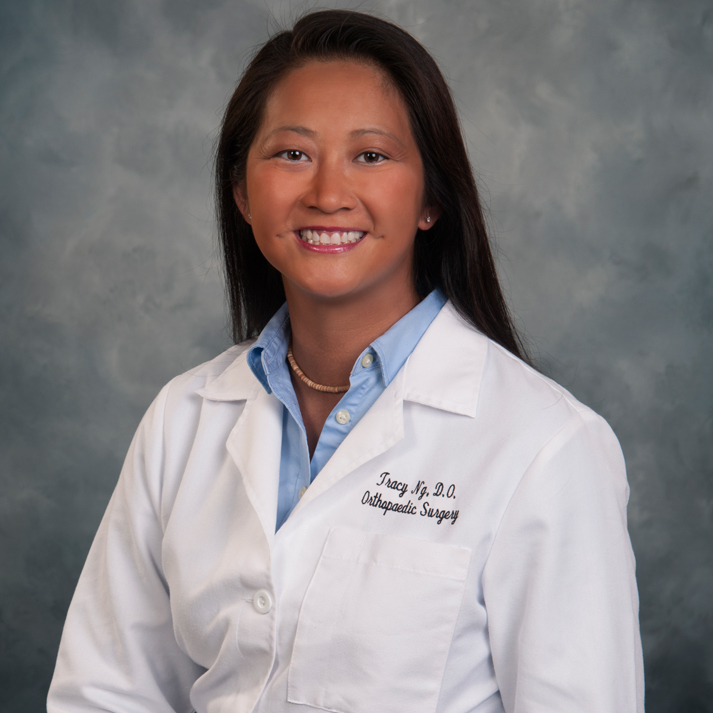 As a fellow in Jackson and New Orleans, Dr. Ng was fortunate enough to study under and operate with world-renowned surgeons including: Felix “Buddy” Savoie, III, MD; Walter Shelton, MD; and Larry Field, MD. During this year she participated in nearly 1,000 surgeries of the shoulder, knee, hip and elbow. Throughout residency and fellowship, she has helped coordinate the care of numerous high school, college, and professional athletes, including sideline coverage for the Jackson State University football team. She is pleased to bring her expertise of Arthroscopy and Sports Medicine to Venice and is looking forward to working with our local and surrounding athletes and teams as well as our other residents. Dr. Ng is excited to join Dr. Julio Gonzalez and the team at the Orthopaedic Center of Venice and continue her work with local athletes and teams. In addition, Dr. Ng provides services at Venice Regional Bayfront Health, Venice HealthPark Surgery Center, ​St. Andrews Surgery Center, ​Englewood Community Hospital, and Doctors Hospital of Sarasota​. In her free time, Dr. Ng enjoys Flowriding, surfing and playing basketball. Dr. Julio Gonzalez is a fellowship-trained orthopaedic surgeon, specializing in surgical and non-surgical treatments and sports medicine. When he is not treating patients at Orthopaedic Center Of Venice in Venice, Florida, he is providing medical services at Venice Regional Bayfront Health, Venice HealthPark Surgery Center, Englewood Community Hospital, and Doctors Hospital of Sarasota. 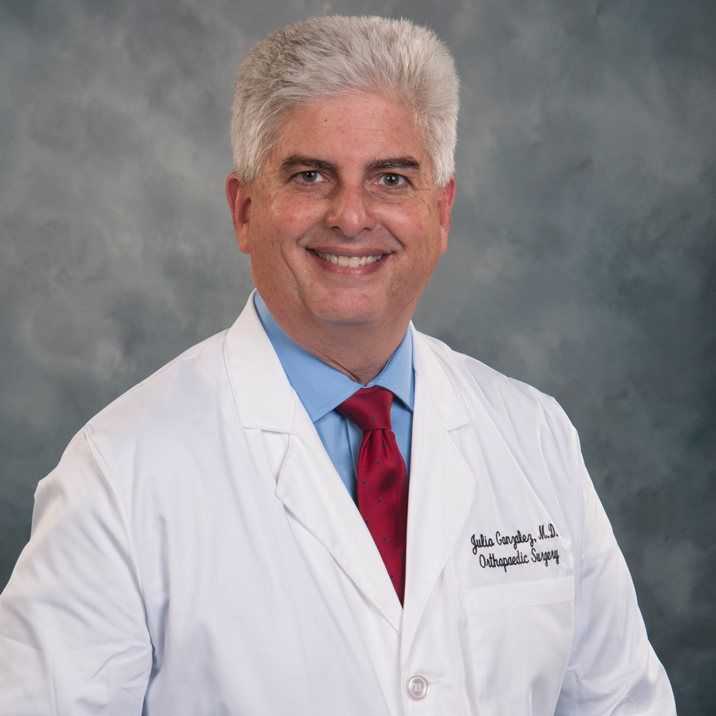 Dr. Gonzalez began his career as a medical doctor at the Naval Hospital in Portsmouth, VA ultimately becoming a flight surgeon at the Naval Aerospace Medicine Institute in Pensacola, FL. He served as a flight surgeon for three years before progressing with his fellowship in knee reconstructive surgery and sports medicine in Orlando, FL. During that time, he was the assistant team physician for the Orlando Magic, Orlando Solar Bears Hockey Team, and the University of Central FL. football and basketball teams. Since beginning his private practice in 2004, he has become a respected leader in the medical community serving on multiple boards at Venice Regional Bayfront Health to ensure the highest quality of patient care and safety. In addition, Dr. Gonzalez has taken many leadership positions with various societies, committees, and associations throughout his community and state. In 2014 he obtained his law degree from Stetson University, and is honored to have been elected into the Florida Legislature as State Representative for District 74.